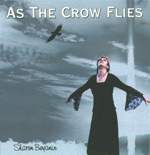 Sharon Benjamin Entertainment proudly announces the release of Sharon's third project, a 6 track EP entitled 'As the Crow Flies'. creating a flurry of interest in music and radio circles across the country. Including five of her most heartfelt compositions to date, this EP is dedicated to the memory of her late father, John Benjamin. The title track itself rightfully deserves a place in the pantheon of great country tunes. It is Sharon’s honesty and skilful songwriting that shines through on this release - great songs always reach out to touch even the most casual listener. Earlier, in 1997 Sharon and husband Mark Hillier formed a duo called 'Strike Two' who recorded a self-titled album, choosing thirteen Australian compositions, nine of which are penned between themselves. There is also a heart wrenching song written by Brent Parlane titled "Marriage In Trouble", and the title track, "Strike Two" written by Dale Juner. There are two cover songs ; and early Seekers track called "Every Road Leads Back To You") and a great rendition of Johnny Chester's hit "Lord I'd Forgotten". Among the original songs, "The Greyhound" with its great line dance beat, is a good fun track. "Ghost Train" is the debut single, taken from the album, and is an up tempo number that tells of busy city life. "Straight As An Arrow" is dripping with Texas Swing while "Come Dance With Me" is not quite a jazz number. You can almost see the house described in "On The Outside", and "White Line" with its raw, swampy, almost haunting emotion paints an awesome picture. "Mr Moon" is for those who like their music a little heavier, whilst "We Don't Talk Anymore" can almost make you cry with its country lyric and waltz rhythm. Sharon has also re-recorded a song from her first album called "Denim Cowboy". With a great new arrangement, the song tells of how a cowboy becomes a misfit in the city. visit the Sharon Benjamin Web site! Real Audio sample of Sharon's hit single "Ghost Train"
Real Audio sample of Sharon's single "Strike Two"